Bike terrorists who deserve to be run over, according to Washington Post columnist Courtland Milloy. There was a time when the media considered itself a fourth branch of government. They were the ones responsible for “keeping them honest” and “speaking truth to power.” Objective arbiters of the truth, journalists were an elite class charged with communicating the news to the rest of us. No organization embodied this high-minded civic sentiment more than The Washington Post, the paper of Woodward and Bernstein, the paper that brought down a president. Believe it or not, but this piece (with its factual errors, stereotyping and threats of violence) was reviewed and edited by editors at the Washington Post. @sharrowsDC Not saying I agree w/ him. Just saying Courtland is pretty good about airing widely held but not widely discussed opinions. You know what other views are widely held? Millions of people believe that Obama was born in Kenya. Others think 9/11 was an inside job. And a big chunk of the US population is certain that UFOs exist. But you don’t see their views in the Post. Why not? Because the Post has editorial standards. They do not allow the beliefs of violent, racist crackpots on to their pages. Unless you’re Courtland Milloy. He’s kept on staff because he’s supposedly the voice of black Washington – though he no longer lives in the city. Lacking a black perspective on the op-ed page, they pay him handsomely for the odd column, though his hate-filled rants would not be tolerated from a white writer. It’s patronizing liberalism at its worst, literally the soft bigotry of low expectations, and occurs despite the fact that there are plenty of talented black voices in this city. Why not look for an African-American Ezra Klein rather than hanging on to this relic from the Marion Barry era? Bikes have a way of revealing biases. For example, gentle-voiced Scott Simon of NPR, also hates and stereotypes cyclists. What other strange views does he hold? Are there other groups he thinks should be singled out for punishment? How do these biases influence what NPR covers? 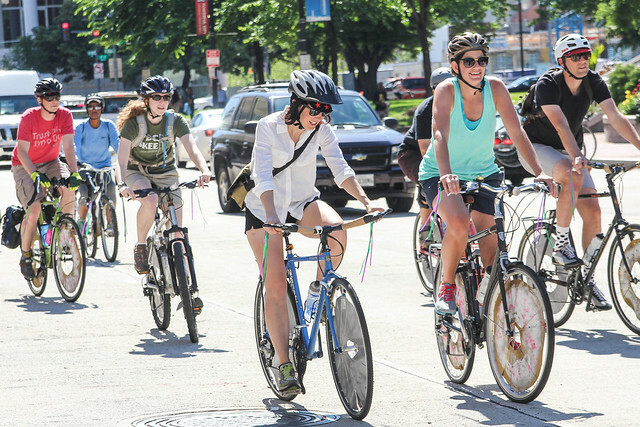 Reporters say nasty things about cyclists because they can. Slurs against cyclists are acceptable while stereotyping other groups is not. Reporters give voice to this hate because there is no punishment for it. These biases exist and influence what stories get covered – and what stories don’t. Anti-cyclist hate is acceptable in the pages of the Post while the birthers are not. The media is not objective. Do not believe what The Washington Post says. The Internet and Twitter provide wonderful real-time fact checking. We no longer have to blithely accept what our self-appointed guardians write, especially if they disgrace themselves by publishing hate-filled rants. The media is not a fourth branch of government – the Internet has assumed that role. Read critically and make up your own mind. Washington Post, What Happened to You? Washington Post, what happened to you? You’re the paper of Woodward and Bernstein, a beloved local institution and a veritable fourth branch of government. Coming home after a Saturday night carousing, I used to love to see the trucks lined up outside your building on 15th Street. Back then (the 90s), the paper was printed right next to the Post’s HQ. Blue trucks would be double-parked along the street, waiting to deliver the news to the region. And if I stayed out late enough, I could pick up the fat slab of Sunday’s paper while it was still technically Saturday night. There was a weird thrill to this, getting the news ahead of everyone else. The Sunday paper was an event, something everyone read. This is all gone now. Where once stories were reported, fact-checked, edited and edited again before the presses rolled, news these days emerges in electronic form, often-rushed and incomplete. This is a good thing. I am for more news, more information, for the great cornucopia of the web. No more gatekeepers, let the public decide what matters. But the Washington Post is an institution. It is a brand expressing journalistic quality and integrity. When they publish something, I expect it to be true. I don’t expect the Washington Post to be running a digital sweatshop, where young journalists are expected to churn out regurgitated news items in the mad pursuit of impossible traffic goals. How does this fit into the great tradition of the Post? The strength of the paper is its ability to really delve into issues. Why are they trying to be like some smarmy blog? And getting a few hits on your site – what is that really winning you? Traffic rushes in to click on a link and then rushes off to some other site. At the What’s Next DC conference, I watched Katharine Zaleski, the paper’s digital news director, give a presentation on the strategy. Coming from the Huffington Post, she brought a relentless focus on metrics. News was to be measured. And the measurement was site traffic. She had charts showing how traffic to the site had increased as the Post increased its “buzziness,” with efforts like news aggregation and blogging. 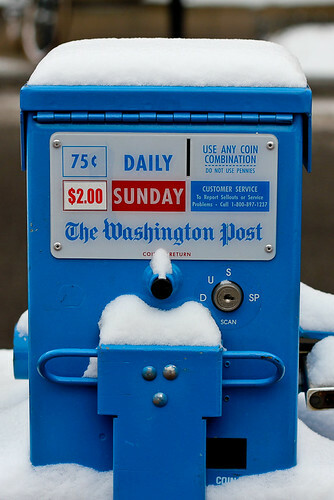 Does the Washington Post really want to emulate The Huffington Post? Do they want to “surf the trend waves on the Internet”? Shouldn’t the paper be making waves rather than trying to catch them? And are ephemeral bursts of web traffic the right metric to follow? If so, why not just turn your site over to cat videos? But the Post is more than that, isn’t it? Stay true to your mission – quality journalism. It’s what you do best. Stop trying to be cool. Don’t go for viral. Avoid “buzziness” and all its advocates. Instead, simplify. Be the Apple of newspapers. Don’t add more web gimmickry to your cluttered and unusable web site. Focus on what you do best. Don’t measure web hits – look at engagement. How long do people stay on the site? How many stories do they read? Try to duplicate the loyalty readers once felt toward the paper that they lovingly held in their hands. Better to have 100,000 devoted readers than a million casual followers. No more second-rate social media. It’s beneath you, Washington Post. Simplify, focus on your strengths and pursue engagement with readers to be true to your news-breaking legacy. Author Joe FloodPosted on April 22, 2012 Categories rantsTags DC, newspapers, social media, washington post, Web 2.01 Comment on Washington Post, What Happened to You? My bike was stolen. I knew I would see it again. I knew that I would one day see my bike again. I just knew it. My old Bianchi Broadway had been stolen off the back stairs of my building. I couldn’t believe that someone had gone to the trouble. The mountain bike was five years old, with worn tires, a temperamental chain, and a skein of rust on its exposed parts. To take it, my thief had to go up two flights of winding metal stairs, break the U-lock, and then carry the bike back down. Looking out that Sunday morning, at the empty spot along the rail where my bike should be, I was surprised. I shouldn’t have been. Kryptonite named Washington, DC as one of the “Top 10 Worst Cities for Bike Theft.” Nationwide, it is estimated that 1.5 million bicycles are stolen every year. An experienced thief can take your locked bike in about 10-20 seconds. I just couldn’t believe that someone would steal something of mine. It hadn’t been an expensive bike, but it was the first bike I had ever owned. And my Bianchi had been with me everywhere. I had commuted on it up the long hill to American University. Ridden on it on pleasant weekend excursions along the C&O Canal. Coasted down the Mall by softball players and tourists. Why would someone steal something of mine? According to the National Bike Registry, the most common reason for bike theft is to pay for drugs. The value of a stolen bicycle is roughly 5-10% of the bicycle’s original retail value. Bikes are even used in lieu of currency in drug transactions. But now my bike was gone. I don’t know why I bothered to report it. The police didn’t even come by to take my report; I filed it by phone. And stolen bikes are rarely recovered. Yet, I knew I would one day see my bike again. For months afterward, whenever I saw a red mountain bike I would stop and squint at it, looking for identifying characteristics. No, the handlebars are too straight. No, the tires are too narrow. No, the bike looks too new. One summer later, I found her. I was walking past a dusty park a couple blocks from my apartment, a little worn square of grass where men sit and drink. I looked over. Something that looked like my bike was leaning against a tree. I stepped into the park. The frame was covered with tacky stickers and duct tape. There was a big gash in the seat. It looked like the gearshifts had been broken off and the tires replaced. But it was my bike. I could tell by the rust. The bike’s owner, a short Salvadoran walked over to me. “This looks an awfully like my old bike,” I said. “No, no, no. Es mine,” he said, pointing to his chest. “I’m not saying you stole it, but this is my old bike,” I insisted. We bantered in broken English and Spanish. “I don’t want no trouble,” he said. He led me out of the park. “You follow, you follow,” he said, waving me on. He got on the bike and rode out of the park, me walking behind him. I was waiting for him to take off and pedal away but he never did. My heart was pounding and I was shaky. Where was he taking me? He was careful not to get too far ahead of me, coasting down the sidewalk, looking back at me. He turned down an empty alley. I followed. He reached a wooden door in a fence and pushed it open. He waved at me to come in. Me and the new owner of my bike squeezed into a narrow passage between a wall and a garage. The door shut. He went to go get someone. I waited in a small courtyard. A man, his neighbor, approached. When he got closer, I saw that he had a Spanish-English dictionary in his hands. I explained that this was my bike. The neighbor got the story out of the Salvadoran man. He and his friend had found it, among junk, along V Street. They had taken it home and fixed it up. They fixed up bikes they found in the area. The neighbor didn’t know where they got them from but that they weren’t thieves. The Salvadoran got anxious during the explanation. “No criminal, no criminal.” He paced in the little courtyard, looking up into my eyes. I didn’t think that he was a criminal. He could have told me to get lost back at the park, or rode off when I was following him. He didn’t have to get his neighbor to try to clear up the situation. He offered me the bike. I didn’t want it. The bike was ruined, and nothing like the bike which had taken me everywhere. I had bought another one a few months earlier. I told him that he could keep it, that I didn’t think that he was a criminal. “No criminal,” the man said, happy. “Problem solved,” the neighbor added, relaxing. The neighbor asked me my name. Joe. His was Joseph. The Salvadoran’s was Jose. “Joe, Joseph, and Jose,” Jose said, pointing at each of us in turn. I squeezed the brakes on my bike one last time and left. Author Joe FloodPosted on June 27, 2002 August 16, 2013 Categories WritingTags biking, crime, DC, washington post, WritingLeave a comment on Steal Something of Mine?